Enjoy smooth operation as a result of our additional comb and sealing bars. The shear cutting system specially developed for untreated municipal, commercial and industrial waste can handle even the most difficult materials. The secret to its productivity are the extremely hard steel alloys and the robust cutters and cutter holders designed to withstand even the hardest foreign objects. The welded cutter holders and particularly sturdy cutters ensure that foreign objects cannot damage the machine. More efficiency with our smart technology: our countershaft drive stores and releases rotational energy depending on the load, meaning more power yet less energy consumption. The countershaft functions like a flywheel mass of approximately eleven metric tons and stores energy to meet peak load requirements. The swivel-mounted hydraulically operated screen unit allows for easy and comfortable access for maintenance and refitting. The screens are available with various mesh widths and can easily be changed by hand by just one person – so you can quickly customise the shredder to the particle size you need. The pusher with extended path provides more space between the cutting system and the pusher, allowing for carefree feeding of larger-volume materials and optimising the processing of bulky goods or bales. 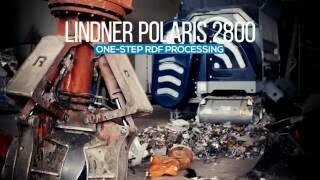 The Lindner Polaris is a highly specialised single-shaft shredder with enormous transmission power. Focused on the single-step production of fuels with medium calorific values (50–100 mm) from untreated municipal, industrial and commercial waste materials for co-incineration, this universal shredder has it all: sturdy design and low operating costs – 24 hours a day, 7 days a week. Incredibly powerful – our tried-and-tested drive with extra power to guarantee maximum efficiency and minimum energy consumption. Synonymous with durability – maximum output and unaffected by foreign objects.